Every speech-language pathologist (SLP) I’ve talked to feels like they’re drowning in paperwork, trying to keep their student records organized (while also respecting student privacy). 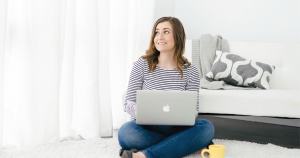 When I started my first job as a school-based speech-language pathologist, I was so excited to dive into therapy with my very own caseload, but I was totally unprepared for the amount of paperwork! I tried lots of systems and tools (iPhone apps, spreadsheets, individual data sheets, daily data sheets), but none of them felt like they fit quite right for my tracking needs. I’m thrilled to share that I FINALLY cobbled together a system that works to keep all my student records organized and private. What’s the crux of my system? Google Forms! 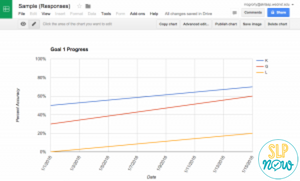 Update: I was loving many features of Google Drive for data (especially the graphs! ), but it ended up being A LOT of work to maintain. I did love taking data digitally! Here’s a peek at what I do now! Here is a quick overview tutorial of how I set up my data sheets. I’ve also included a written description with screenshots below. I store each student’s form in a folder, based on which day(s) I see them. The “Multi” folder is for students that I see multiple days a week. You could also sort by teacher or grade or just keep all students in one folder! I also enter any data taken during the session. If I didn’t target a specific goal, then I just leave it blank. I also like having space to enter any notes and make note of anything specific I want to do next week. And you can set it up to make beautiful graphs! (Parents, students, teachers, and administrators love this part.) This example includes percentages, but I especially love using rating scales to monitor progress. 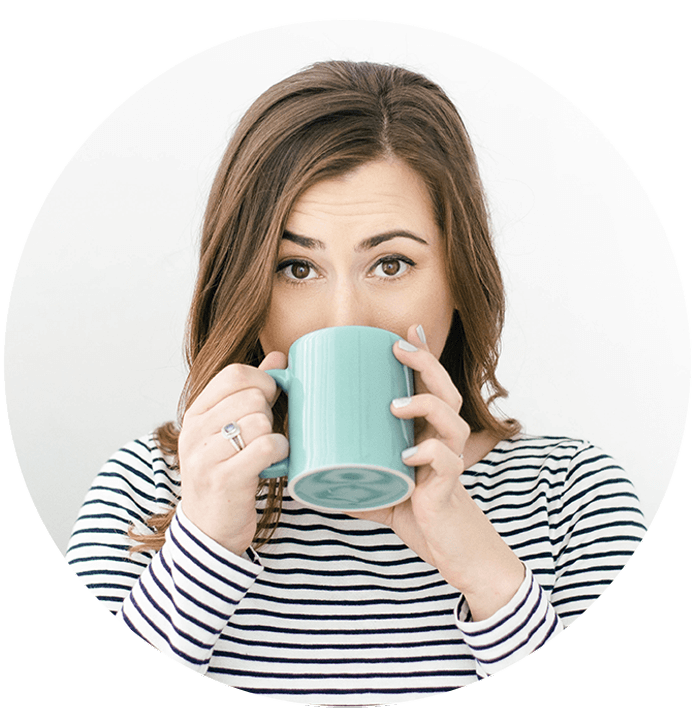 Schoolhouse Talk has an amazing product to help get you started. Check it out here. 2. Everything is stored in one place. No more lugging around data binders! 3. It is easy to involve my students in the data taking process. They can easily enter their progress in the form. I made QR codes so that we can scan the code and pull up their form, which they love! 4. It is easy to review student progress. I set up the Google Sheets to create graphs using the data. These visuals are great to share with parents and students. I’m hoping they’ll make progress reports a breeze. 5. 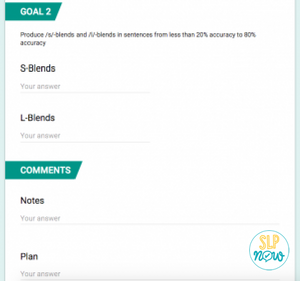 The Google Forms could be great for collaboration. I haven’t done this yet, but I could share the form with a teacher or a therapist. 6. 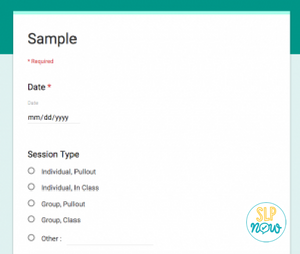 You can easily customize each student’s form. Makes for easy and efficient progress monitoring. 7. It helps reduce clutter in my speech room. I still have a lot of papers in my room, but this really cuts down on the amount of papers I have floating around throughout the day. 1. Glitches. There haven’t been many, but they do come up from time to time. They could all be fixed by re-opening the browser. 2. There is some initial setup time. It took me a few hours to set up all the forms, enter students’ goals, set up the graphs, etc. 3. Some people are worried about confidentiality. I use my school Google account and set up the best possible security settings. I only use initials in the forms and never include any identifiable information. 4. Internet connectivity. If the internet is down, then you’re out of luck! Not sure which data system is best for you? Check out this quiz to help you narrow down the options! 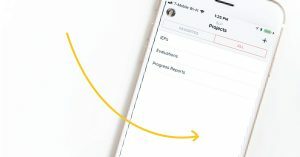 This is such a great and easy way to track progress! Thank you, great post! Will a Google doc suffice in the event of a Medicaid audit? Thanks for your comment, Kelli! I would check with your district, but I think it would be okay if you printed out the notes. In case of an audit, you would likely need to have a hard copy of the notes in your students’ files. I love this! Thanks! I have tried using Google Forms for data in the past, but got bogged down with how complicated I was trying to make it. Aw thanks, Becca! I hope this is helpful. Feel free to let me know if you have any questions! Hi there! Found your website through a Pinterest pin, and I’m very impressed with your Google Form. Can you please tell me how your got the pretty, colored headers on the Form? Thank you! The colored headers don’t show up when you’re creating the form, but they will show up later. Click on the “Add header and description” option (on the right side, icon with two T’s). When you go to enter data, you’ll get the pretty headers! If you watch the video (apologize in advance for my sick voice! ), what I did there is how I got the headers to show up. P.S. Thank you for your feedback! You are too sweet! Thank you for returning my comment and answering my question! Even though this is my 15th year as a SLP, I am still learning to improve my data collection and appreciate the techie advise and tutorials from you who are much more tech savvy and willing to share! Bravo! I tried Google forms a little bit last year, but did not have much success. I think it was mostly do to getting in and adding data before our session was done. I LOVE using QR codes to access a students Google form. My kiddos love using the scanner! I cant wait to retry this system again. My kids loved the QR codes too! So fun! Great information here!! Thank you! Are you taking data while the students are with you? Do you still keep a folder of therapy materials in progress and for future sessions? I was just wondering how you do the planning for therapy part. Always trying new ways of doing things! I do take data while students are with me, but I switched back to my paper data sheets (http://roadtospeech.com/studentdata/). I have a template that includes a list of my students and their goals (one sheet for each day of the week). I include room to write out my plans. Then I make sure I know where to find my materials! My most frequently used materials are easily accessible, and I just pull more seasonal items and keep them in a bin by my therapy table. During my sessions I may only target 1-2 of their goals (depends on the student). 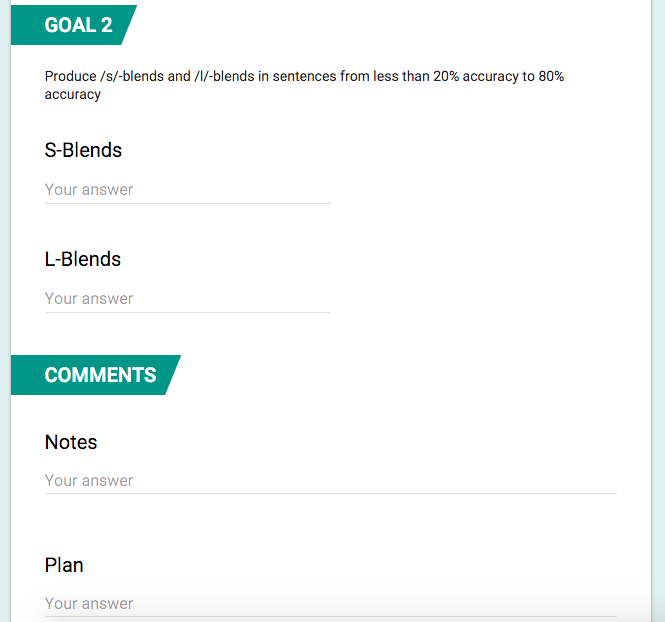 How do you document that a goal was not targets in google forms? I would love to use the chart, but if you put 0% or no information it messes up your chart. Any tips? I usually only target 1-2 goals at a time as well. If I didn’t target a goal, I usually just left it blank. I switched back to paper data sheets, so I’m not sure if something changed on Google Forms. I did have a graph for each individual goal. Maybe that’s it? Thank you for getting back to me. 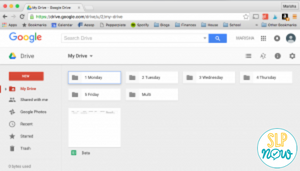 What made you stop using google forms? There were a number of different factors. I discovered SLP Toolkit, which took out a lot of the manual work. I also changed up my lesson planning process, and printed data sheets seemed to work better. I’m very visual and like using sticky notes for reminders. I just couldn’t find a good (and quick) solution to make that happen with Google Forms. Do you have any suggestions on how to keep artic data on sounds in words vs. sentences… Etc. Also where do you keep all the QR codes? Hey there! I love using rubrics to make tracking easier–especially if a student has a goal to move from isolation to sentences (or more). This post by Schoolhouse Talk has some good ideas (http://slp123.blogspot.com/2014/04/using-rubrics-to-track-data.html). I’m just so impressed by you! Do you sleep, though? I don’t know how you do it all! Haha 😉 Thank you so much for creating this video tutorial. It’s taking me a while, but I’m getting quicker. I think this system will really help with data and progress tracking! Thanks, Susan! Keep me posted! 2nd year SLP here, still trying to figure out the best method for my data tracking! I started using google docs this year to rack, but certainly didn’t perfect it! This video was amazing and I can’t wait to try it out next year! I’m super excited that the charts will take care of themselves and there is one less time consuming piece to worry about! Thank you! So I am trying google forms this year! I am excited to say good by to large binders and writing notes/data. Your post has been very helpful. Here is one problem I am running into-every time I click on a form, it shows me the edited version and I always have to hit preview before I can enter my data/submit the form. Is there an easy fix to this? Hi Stephanie! You’ll want to save the link to the “public” form. At the top of the window, click Link. To copy the link that appears, click Copy or press Ctrl + C (Windows) or ⌘ + C (Mac) on your keyboard.